How Do We Know the World Is Round? Here is a map of the world, drawn on the Azumuthal Equidistant projection, and centered on the North Pole. 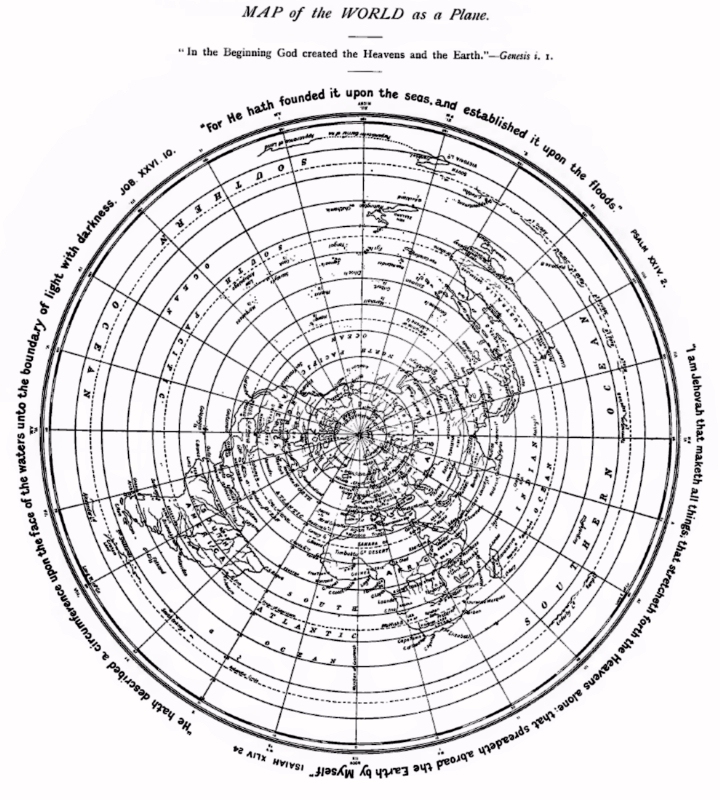 There is one unusual thing about it: it is taken from a book, published in the year 1901, that argued that the Earth was flat, and that this map showed the actual shape of the Earth's surface. If you never travel more than a hundred miles or so in any direction, there is no reason for the Earth not to seem flat to you, as far as you would know from direct experience. So this makes the idea that the Earth really is flat in its entirety a tempting one. But in our age of jet travel, where the fact that one can go East by going West, as proven by the journey of Ferdinand Magellan, is a fact of everyday experience, one has to take the world as a whole into account. Considering the world to have the shape shown by the map above is certainly a good try. Have the Sun circle the North Pole, in a circle that shrinks during summer in the Northern Hemisphere and expands during the winter, at a suitable distance above the Earth, and one can account for world time zones, people going East from Vancouver, and West from New Delhi, and both ending up in Tokyo. None the less, while this map represents a nice try, some things just don't add up. Because Australia is at quite a southern latitude, it appears quite stretched on this map. It would be easy enough for one person to set up a sundial in his garden in Sydney, on the East coast of Australia, and another person to set up a sundial in his backyard in Perth, on the West coast of Australia, to demonstrate that the observed solar time in those two cities does in fact differ by over two hours, as would be expected by them being separated by just over 35 degrees of longitude. Since Sydney and Perth are both situated on the landmass of Australia, it is at least theoretically possible to journey from one of them to the other by automobile, and inspect one's odometer at the beginning and end of the journey. This would not, in fact, be trivial. The area in the middle of Australia separating the two cities happens to be a fierce and inhospitable desert, not to be travelled lightly. However, it is not as if a journey from Rockhampton to Camarvon, in more or less a straight line, by way of Alice Springs, is what is being discussed here. That, indeed, would be something best left to a convoy of experts, in a fleet of all-terrain vehicles well supplied with food and water. Sydney and Perth are both in the south of Australia. So there are roads, for the most part close to the coastline, which significantly moderates the climate, so one could go from Sydney to Wagga Wagga and then Adelaide, and then proceed on from Adelaide to Port Augusta and then Kalgoorlie, and finally to Perth, and there would be at least actual roads on which to drive. There are even a number of other cities and towns along those roads, but it may still be necessary to take supplies of food, gasoline, and water as well as observing other safety precautions, for at least some stretches of the journey even so. And the point of that, of course, is that if the distance from Sydney to Perth is not more than twice as long as a journey across 35 degrees of longitude in, say, Canada would be, then the circle upon the Earth made by the parallel of latitude for 30 degrees south latitude is too small to fit on a flat Earth of the type depicted, as instead the Earth closes up as one goes South, and the Earth must then be round... as this kind of flat Earth is the only alternative left.